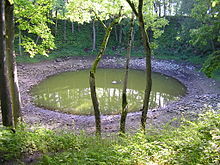 Kaali is a group of nine meteorite craters in the village of Kaali on the Estonian island of Saaremaa. Most recent estimates put its formation shortly after 1530–1450 BC (3237+/-10 14C yr BP). It was created by an impact event and is one of the few impact events that has occurred in a populated area (other ones are: Henbury craters and Carancas crater). Before the 1930s there were several hypotheses about the origin of the crater, including theories involving vulcanism and karst processes. Its meteoritic origins were first conclusively demonstrated by Ivan Reinvald in 1928, 1933 and 1937. The main crater is nearly circular. When the water level is low, rocks can be seen penetrating the surface: in the middle of the crater. The impact is thought to have happened in the Holocene period, around 3,500 years ago. The estimates of the age of the Kaali impact structure (Saaremaa Island, Estonia) provided by different authors vary by as much as 6,000 years, ranging from ~6,400 to ~400 years before current era (BCE). Analysis of silicate spherules in Estonian bogs show that the possible age of the impact craters could be approximately 7,600 years. A study based on elevated Ir signal in a nearby bog suggested much younger age of 4th century BC. The craters were formed by a meteor with an estimated impact velocity of between 10 and 20 km/s (22,000 and 45,000 mph) with a total mass of between 20 and 80 metric tonnes. According to some researchers the meteor arrived from the north-east. At an altitude of five to ten km (20,000 to 30,000 ft), the meteor broke into pieces and fell to the Earth in fragments, the greatest of which produced a crater with a diameter of 110 m (360 ft) and a depth of 22 m (72 ft). The explosion removed approximately 81,000 m3 (2,900,000 cu ft) of dolomite and other rocks and formed a 7 to 8 km (20,000 to 30,000 ft) tall, extremely hot gas flow. Vegetation was incinerated up to 6 km (3.7 mi) from the impact site. Kaali Lake (Estonian: Kaali järv) is on the bottom of this crater. Eight smaller craters are also associated with this bombardment. Their diameters range from 12 to 40 m (39 to 131 ft) and their respective depths vary from one to four metres (3.3 to 13.1 ft). They are all within one kilometre (0.62 mi) of the main crater. According to the theory of more recent impact, Estonia at the time of impact was in the Nordic Bronze Age and the site was forested with a small human population. The impact energy of about 80 TJ (20 kilotons of TNT) is comparable with that of the Hiroshima bomb blast. It incinerated forests within a six km (3.7 mi) radius. Scholars maintain that the event figured prominently in regional mythology. It was, and still is, considered a sacred lake. There is archaeological evidence that it may well have been a place of ritual sacrifice. At some point during the early Iron Age, the lake was surrounded by a stone wall 470 m (1,540 ft) long, with a median width of about 2.5 m (8.2 ft) and an average height of 2.0 m (6.6 ft). Finnish mythology has stories that may originate with the formation of Kaali. One of them is in runes 47, 48 and 49 of the Kalevala epic: Louhi, the evil wizard, steals the Sun and fire from people, causing total darkness. Ukko, the god of the sky, orders a new Sun to be made from a spark. The virgin of the air starts to make a new Sun, but the spark drops from the sky and hits the ground. This spark goes to an "Aluen" or "Kalevan" lake and causes its water to rise. Finnish heroes see the ball of fire falling somewhere "behind the Neva river" (the direction of Estonia from Karelia). The heroes head in that direction to seek fire, and they finally gather flames from a forest fire. According to a theory first proposed by Lennart Meri, it is possible that Saaremaa was the legendary Thule island, first mentioned by ancient Greek geographer Pytheas, whereas the name "Thule" could have been connected to the Finnic word tule ("(of) fire") and the folklore of Estonia, which depicts the birth of the crater lake in Kaali. Kaali was considered the place where "The sun went to rest." The asteroid 4227 Kaali is named after it (except for their names, there is no connection between this asteroid and the crater). ^ "Kaalijärv". Earth Impact Database. University of New Brunswick. Retrieved 2008-12-30. ^ Losiak, A.; Wild, E. M.; Geppert, W. D.; Huber, M. S.; Jõeleht, A.; Kriiska, A.; Kulkov, A.; Paavel, K.; Pirkovic, I. (2016-04-01). "Dating a small impact crater: An age of Kaali crater (Estonia) based on charcoal emplaced within proximal ejecta". Meteoritics & Planetary Science. 51 (4): 681–695. Bibcode:2016M&PS...51..681L. doi:10.1111/maps.12616. ISSN 1945-5100. ^ Raukas A.; et al. (1995). "On the age of the meteorite craters at Kaali (Saaremaa Island, Estonia)". Proceedings of Estonian Academy of Sciences, Geology 44:177–183. ^ Veski, Siim; Heinsalu, Atko; Kirsimäe, Kalle; Poska, Anneli; Saarse, Leili (2001-10-01). "Ecological catastrophe in connection with the impact of the Kaali meteorite about 800–400 B.C. on the island of Saaremaa, Estonia". Meteoritics & Planetary Science. 36 (10): 1367–1375. Bibcode:2001M&PS...36.1367V. doi:10.1111/j.1945-5100.2001.tb01830.x. ISSN 1945-5100. ^ a b "Kaali Crater". Wondermondo. 2012-11-22. ^ Siim Veski; Atko Heinsalu; Kalle Kirsimäe; Anneli Poska; Leili Saarse (2001). "Ecological catastrophe in connection with the impact of the Kaali meteorite about 800–400 BC on the island of Saaremaa, Estonia" (PDF). Meteoritics & Planetary Science. 36 (3): 1367–1375. Bibcode:2001M&PS...36.1367V. doi:10.1111/j.1945-5100.2001.tb01830.x. ^ a b Lennart Meri (1976). Hõbevalge (Silverwhite). Tallinn, Estonia: Eesti Raamat. Tiirmaa, R. (1992). "Kaali Craters of Estonia and Their Meteoritic Material". Meteoritics. 27 (3): 297. Bibcode:1992Metic..27Q.297T. Anto Raukas; J.-M. Punning; T. Moora; Ü. Kestlane; A. Kraut (2005). The Structure and Age of the Kaali Main Crater, Island of Saaremaa, Estonia. Impact Studies. pp. 341–355. doi:10.1007/3-540-27548-7_13. ISBN 978-3-540-24181-2. Wikimedia Commons has media related to Kaali crater.